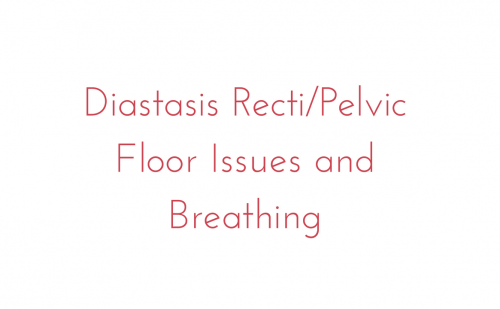 What does Breathing Have to do with Diastasis Recti and why is it so hard to do? Great Question! Let’s first get a little clear on Diastasis Recti. What it is and what are some causes. Diastasis Recti is a pressure issue in the abdominal cavity. Meaning there is too much load/weight/pressure on a structure that is not designed to bear that load. Many people actually think it means you have a weak core. While a weak core is indeed the outcome- the issue of WHY you have a diastasis recti is often a combination of factors: a main one being extra pressure in your abs. When our abs have too much pressure (either from breathing patterns, stomach tension, or postural tendencies) – the connective tissue running from your ribs to your pubic bone- that the abdominals are attached become overstretched and thin out. As a result the 2 sides of your rectus abdominis (RA muscles/6 pack) separate from the midline. Hence the diastasis recti. Don’t be mistaken- the connective tissue connecting the two halves of your RA muscles is strong, resilient, able to stretch and rebound and is designed to withstand load/pressure. But only to a certain degree. If there is excessive pressure in your abdominal cavity then that tissue cannot bear the loads anymore and overtime a diastasis recti forms. Added to that is the fact that many of us have not been moving through the ranges we are designed to move and so our connective tissue might not be functioning to its fullest capacity or as adaptable as it should be. The majority of us operate in an environment that does not demand a lot of movement variation and a variation of loads on our structures. We are pretty stagnant, our movements are repetitive, and our muscles are not used to contracting and yielding multiple times a day in multiple ways, shapes and positions. The result is that our connective tissue gets rigid and unable to respond appropriately to extra loads (loads like pregnancy and weight gain). Now let’s get more clear on breath. Breathing is one of the MAIN culprits for too much pressure in your abs! Most of the people I see are belly breathers and their ribs barely move. When you breathe and “expand” or “fill” up your belly – each breath places extra pressure upon the abdominal contents and places more load on your connective tissue as well. Meaning that by belly breathing you are creating a compromised not so optimal extra-pressure situation in your belly. Belly breathing over the course of many years places excessive load on the connective tissue and ultimately that load becomes too great for the tissue to withstand and it begins to overstretch and thin, leaving you vulnerable to a diastasis recti, other core related issues and back problems. All that extra pressure is also very related to pelvic floor dysfunction so if you suffer from any incontinence, pain, prolapse, etc – you definitely want to explore your breathing patterns. 3-dimensional rib breathing as you will learn about in the posted video does not place excessive pressure on your abs or your pelvic floor. Additionally, your ribs are connected to your mid and upper spine so NOT using your ribs when you breathe means that your mid and upper back and spinal muscles are denied essential movement creating tension and tightness and even hunching and rounding in your mid and upper back. No bueno. Please note- breathing patterns do not work alone. A diastasis recti is often a combo of poor breathing patterns, muscle imbalances, and postural tendencies. Cleaning up breathing patterns is the first step in my Restore Your Core program and in my private sessions because I have seen huge changes in my clients before they even begin one movement exercise by just addressing breathing issues. And why is rib breathing so hard? Only because you are not used to it. Your rib muscles are tight from underuse, your body yet has not figured it out and it is not natural or normal for you to do. Once you practice for a while, 3-d breathing becomes more and more normal and natural for you to the point where you do not need to think about it. Watch the video and give it a go!